Players Wage War as the Mad Titan Thanos. The Marvel’s Avengers: Infinity War Character and Level Pack level pack can be purchased separately or as part of the Season Pass which includes six Level Packs and four Character Packs, including the previously released Guardians of the Galaxy Vol. 2, Black Panther, Runaways, and Cloak & Dagger content, and the Champions, Out of Time, and Agents of Atlas Character Packs. The Season Pass is available for £11.99 suggested retail price or as part of the LEGO Marvel Super Heroes 2 Deluxe Edition, which features the main game and access to the Classic Guardians of the Galaxy Character Pack. 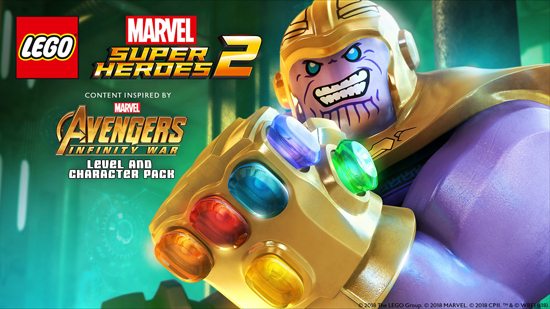 Marvel’s Avengers: Infinity War Character and Level Pack, the new DLC for LEGO Marvel Super Heroes 2. The upcoming pack, available at £2.49 on PlayStation 4 and Steam and at £2.39 on Xbox One, adds a level and characters straight from the comics in celebration of the upcoming film, Marvel Studios’ Avengers: Infinity War, in theatres nationwide on 27th April. LEGO Marvel Super Heroes 2 is available onPlayStation 4, Xbox One, Nintendo Switch, and Windows PC.